Celtic flask features stainless steel construction along with a copper plated Tree of Life emblem on a removable shot cup. 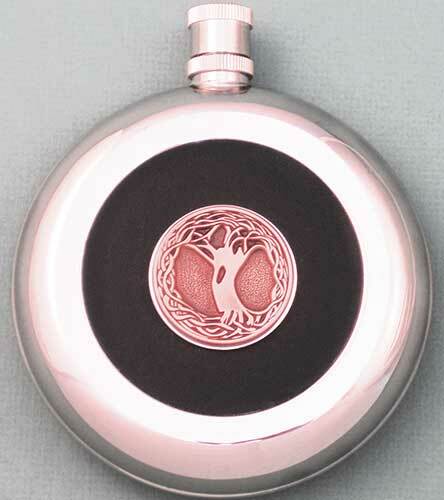 This Irish flask features a copper plated over pewter Tree of Life emblem that is centered on top of the built-in removable shot cup. The Tree of Life emblem is enhanced with elaborate Celtic knot-work roots, branches and leaves. The Tree of Life flask will hold 8 ounces of your favorite whiskey and is complete with a removable clip that screws onto the neck. You may use the clip to attach the Celtic flask to your belt loop along with your golf bag or back pack. The stainless steel flask is made in the United States and it is gift boxed with Celtic knot and Tree of Life history cards, complements of The Irish Gift House. 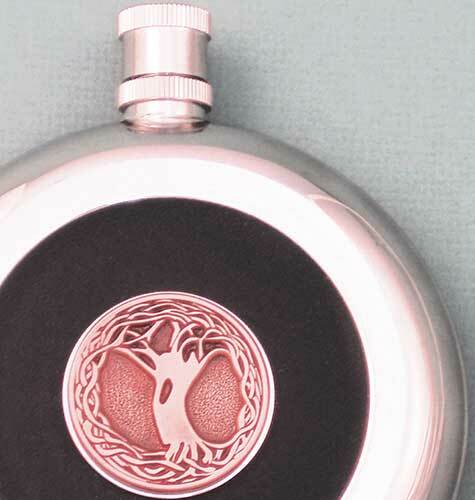 Celtic flask features stainless steel construction along with a pewter Tree of Life emblem on a removable shot cup. Celtic flask features stainless steel construction along with a gold plated Tree of Life emblem on a removable shot cup. Irish flask features a copper plated Celtic cross emblem that is enhanced with knot-work.